"Thank you, Almondstar." meowed Olivestem. "Olivestem, Olivestem, Olivestem!" cheered Littlefur for the clan's new deputy. Willowtail purred and licked at the two tiny kits at her side as they mewled and squealed for milk. As she touched her nose to both kits, she sent a silent thanks to StarClan for a healthy litter. Olivestem padded over and took her place at the front of the crowd. 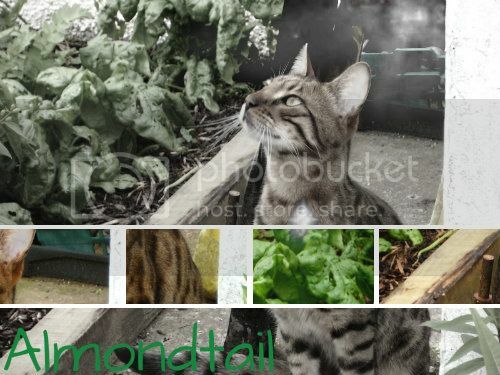 "I, Almondstar, Leader of ThunderClan, call upon my warrior ancestors to look down on this apprentice. She has trained hard to understand the ways of your noble code, and I commend her to you as a warrior in her turn. Flickerpaw, do you promise to uphold the warrior code and protect and defend this Clan, even at the cost of your life?" "Then by StarClan, I give you your warrior name. Flickerpaw, you will be known as Flickerstorm. StarClan honors you and we welcome you as a full warrior of ThunderClan." Padding forward, Almondstar rested his muzzle on top of Flickerstorm's head. Flickerstorm licked Almondstar's shoulder, then sat back and listened to the clan call out her new name. "Flickerstorm, Flickerstorm, Flickerstorm!" cheered Lizardheart for the clan's newest warrior. Rowanspider padded into the ThunderClan camp, carrying a poppy head in his jaws. He made his way into his den, placing the poppy head into the storage. Brokenclaw pulled a thrush from the fresh-kill pile and sat down to eat. "I, Almondstar, Leader of ThunderClan, call upon my warrior ancestors to look down on this apprentice. She has trained hard to understand the ways of your noble code, and I commend her to you as a warrior in her turn. Cometpaw, do you promise to uphold the warrior code and protect and defend this Clan, even at the cost of your life?" "Then by StarClan, I give you your warrior name. Cometpaw, you will be known as Cometfang. StarClan honors you and we welcome you as a full warrior of ThunderClan." Padding forward, Almondstar rested his muzzle on top of Cometfang's head. Cometfang licked Almondstar's shoulder, then sat back and listened to the clan call out her new name. "Cometfang, Cometfang, Cometfang!" cheered Linseedpaw for his littermate. Squirrelfur purred and licked at the single she-kit at her side as they mewled and squealed for milk. As she touched her nose to the kit, she sent a silent thanks to StarClan for a healthy kit. "We gather today to welcome six kits into their lives as apprentices." continued Almondstar once the clan had gathered. "Beetlekit, you will be known as Beetlepaw. Barkpelt, you will be mentor to Beetlepaw. Petalkit, you will be known as Petalpaw. Sharpfall, you will be mentor to Petalpaw. Redkit, you will be known as Redpaw. Midnightonion, you will be mentor to Redpaw. Clearkit, you will be known as Clearpaw. Smallflight, you will be mentor to Clearpaw. Houndkit, you will be known as Houndpaw. Desertpelt, you will be mentor to Houndpaw. Cinnamonkit, you will be known as Cinnamonpaw. Since you have shown an interest in healing, Rowanspider will be your mentor." Cinnamonpaw puffed out his chest and padded over to Rowanspider. "Let's go get you a nest sorted out and go over some remedies." meowed Rowanspider as he touched noses with Cinnamonpaw.